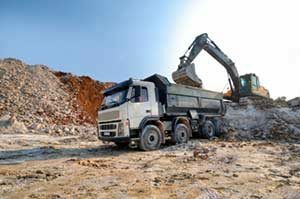 Dirt Connection’s Dump Truck Hauling services are great for transporting loose material like sand, gravel, or demolition waste to support heavy construction projects. These trucks can fulfill a number of functions at a construction site, including hauling in the building materials then hauling out any torn down parts. Virtually all dump trucks operate by hydraulics in order to lift and move large quantities of materials as needed. 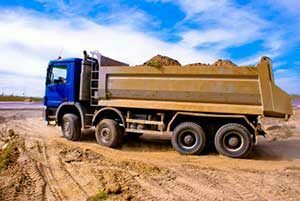 The large, sturdy tires of the dump truck makes it ideal for construction sites as well, as the tires will withstand sharp nails and debris that could be harmful on regular-grade tires. Dirt Connections has the means to transport whatever materials you need, regardless of how large or small your project is. Our affordable and convenient delivery can be counted on to get everything done right on schedule. Contact us today to discuss your project and transportation needs!